Lex Luthor has completed an enhancement project that will augment humans, using technology from the Fortress of Solitude. He engages Jonathan and Martha Kent in discussion about what it is that Superman/Clark needs. 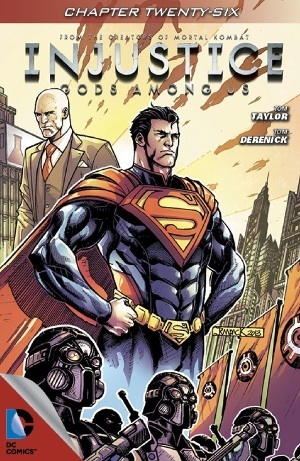 Lex believes it's allies with superhuman abilities, while the Kents believe he needs more than that. The Flash questions Superman on his and Lex's endeavor, and before it becomes an argument, Superman invites Flash to play a game of chess. The Flash is unaccustomed with chess, but learns at light speed and the two play with Superman beating Flash for the opening match. Martha relates a story of Clark losing his security blanket, and the result is him losing his temper, and overturning a tractor. It's the first time that he displays his powers as well. When asked if Superman is a scared child, Martha replies "Aren't we all?" The Kents remind Lex that for all his abilities, Clark is just a man and can make mistakes. Jonathan tells Lex that when the time comes, they hope that Lex will be able to stop Superman. The Flash and Superman continue to play chess, debating on how far one should go to save lives. Superman is left to ponder his next move, after having been beaten several times. Story - 2: OK. One step forward, three steps backwards. You may have been surprised to learn that Superman's parents are still living. When Lois was killed, we saw nothing of them and there was no conversation with them before or after he murdered the Joker. Even now there has been no conversing with his parents; instead that communication has been reserved for Lex Luthor of all people. Who is this Superman? Is he the child as Martha describes him, who cannot function without his security blanket i.e. Lois Lane, with the Joker filling for the overturned tractor? He seems to have no connection with his parents, who are supposed to be the stabilizing force in Superman's life. He only brought them to the Fortress after they were abducted by Mirror Master; a move that showed a lapse in logical thought as well as storytelling. The fact that they are still at the Fortress is ridiculous, as no one is going to cross Superman now. He'll kill them. It would seem that this Superman has a dysfunctional relationship with his parents, who claim to love him, but have done nothing to rein Clark in. Their descriptions of him are belittling and insulting. Jon Kent won't talk to his son, but he'll put his trust in Lex Luthor to stop him when he becomes the inevitable despot that he fears? It's madness, particularly if Clark overhears any of the conversation. The Kents have given up on Clark with a smile and platitudes, which might explain why Superman's ethics are so discordant with what we would know them to be. However, we've not been shown anything to support this conjecture, and it's just not fair to the reader that we should have to piece together what is going on with Superman and why. The chess match is an accidental reflection of this storyline in totality. If you play chess, you've probably heard the importance of "middle field". If you control the middle field, you're more likely to win the game. The arguments raised by the Flash are trite at best. We know why we don't confiscate cigarettes, because no one is going to place one against your head and rob you. It won't accidentally go off and kill someone if you drop it. What's more, we can legislate to make cigarettes more difficult to obtain and keep them out of the hands of minors. We also accept that if all that fails, the individual has a right to consume a cigarette; it is their body after all. The same logic can never be applied to a firearm. The Flash has to win the argument for dramatic conventions, so we see that Superman is wrong, but what it does display is the lack of logical thinking on Taylor's part. We do imprison people who speed in their autos; we do incarcerate people who leave animals unchained. It's why we have laws. We won't kill someone who doesn't recycle, because we have effective ways of penalizing the person that do not require death, not that death would ever be required. Taylor is searching for the counterbalance to the scenario he's created, but there is none in this world. The answer, which he gave long ago, is that killing is what's needed for the situations that he's put Superman in. The answer is that power must assert itself, rather than ethics and reason. It's an unreasonable position, and the result is the current chapter. In addition, anyone's who's played chess would know that checkmate isn't the only result a match can have. There's also a stalemate and a draw. Had Taylor allowed the matches to end in draws, it would have been more fitting as both Superman and the Flash have undeveloped ideas about how to protect the world (the Flash's being ludicrous by design). It would also have been more logical, as there are a limited number of moves in a chess match, and the two them would know all of them after the opening, with the speed their brains work at. The Flash, however, is the voice of pseudo-reason, so he has to win, just as Superman has to lose because he's killed. Art - 3: Derenick! He has a way of making the story more than tolerable. It would have been nice if Jon and Martha Kent were the same age as when we first saw them. The Fortress must have a Ponce de Leon effect. Cover Art - 4: Same as last time, with a growing desire to see those flying beings.